I loved this show as a child. I waited for that moment when the rumpled, allegedly forgetful detective turned back to the suspect who thought they’d gotten away with it. Columbo would say something like: “Just one more thing” or “There’s something that bothers me” or “Just one more question” or “Just a few loose ends to tie up”. Then you knew and the suspect knew, they were caught. The classic false exit ending. Columbo was one of the best inverted detective format shows ever. No whodunit. You knew who did it, in fact many times in Columbo we saw not only who did it, but how they did it. The problem was proving they did it. Catching them. Columbo was on from 1968-2003 (with some time off here and there). Well-known for his crummy looking trench coat, his meandering, overly chatty style and his keen eye for detail, he was unusual and fun to watch. In between telling the suspects personal details, some of which were actually true, asking them how much they paid for their shoes, asking about things for his wife (anyone remember the best-forgotten spinoff Mrs. Columbo starring Kate Mulgrew? ), looking around their homes, cars, etc. he always found the clues that caught the bad guys. 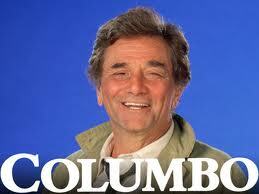 Peter Falk wasn’t the only actor to play Columbo, but he was certainly the favourite. His seemingly absent-minded portrayal of Lt. Frank Columbo was brilliant and unforgettable. 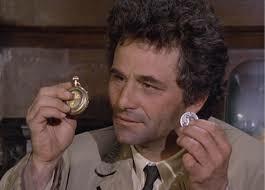 I loved Peter Falk in so many things, especially Murder By Death, The Princess Bride, and the trilogy of Christmas movies where he played a quirky angel named Max, but for me and most people he will forever be Columbo. Did you see Peter Falk in those Wim Wenders’ movies? Yes, he was great in Wings of Desire. I don’t think there was anything I didn’t like Falk in, even Ray Parker Jr’s Ghostbusters vid, Cookie or Corky Romano. He was a often underrated talent that is missed. I knew a lady, also an actress, who knew him from the old days in Hartford, Conn. She said he was a great guy.